Immature Tuberculatus neglectus are bright yellow with pale siphunculi (see first picture below). 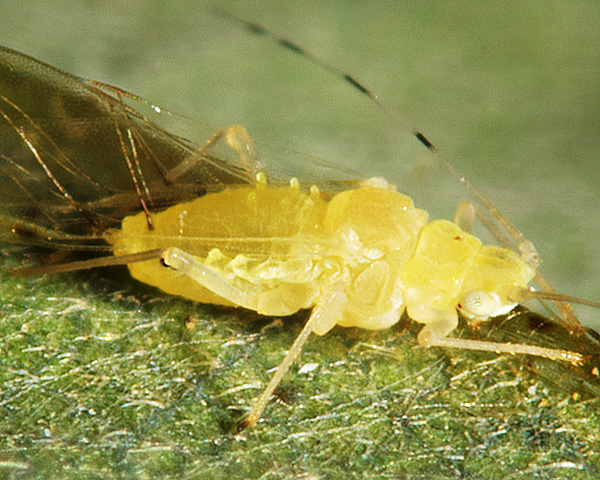 Adult alates of Tuberculatus neglectus are yellowish with a darker yellow mesothorax (see second picture below). The eyes are whitish yellow, and the pale antennae are banded with black. The antennal terminal process is 1.14-1.53 times longer than the base of the sixth antennal segment (cf. Tuberculatus annulatus in which the antennal terminal process is 0.87-1.14 times as long as the base of the sixth antennal segment). The three pairs of spinal tubercles on abdominal segments I-III are of similar size (see second picture below) (cf. Tuberculatus annulatus which has the most anterior tubercle much larger than the other two) . The siphunculi (see second picture below) are dark except right at the base, and are longer than the knob on the cauda. 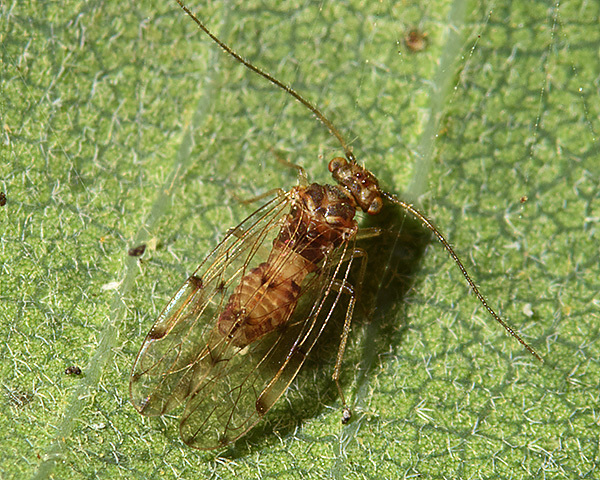 The body length of the adult alate Tuberculatus neglectus is 1.4-2.2 mm. Tuberculatus neglectus lives on the undersides of leaves of sessile oak (Quercus petraea). It occurs more rarely on English oak (Quercus robur) and on hybrids between the two oak species. 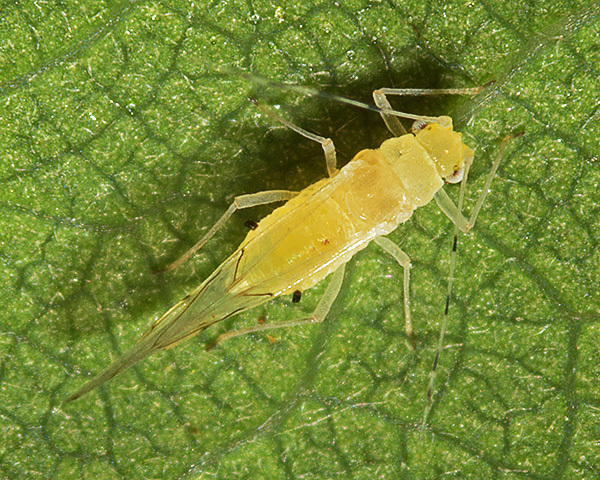 Immatures are more commonly observed than adults, and can be found usually in low numbers scattered over the undersides of the leaves. Sexual forms can be found in November. It is found in northern and north-west Europe. The two European oaks, the sessile oak (Quercus petraea) and the English oak (Quercus robur), are fairly readily distinguished. 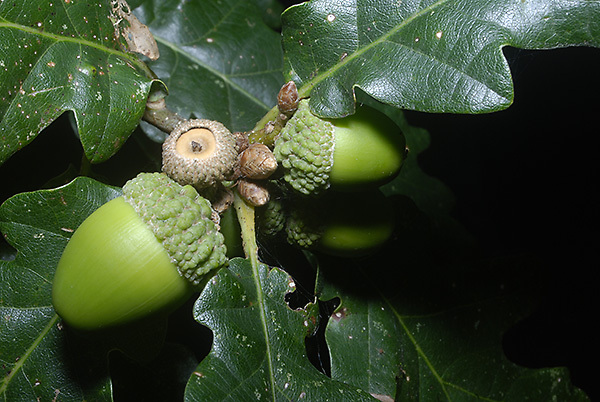 The sessile oak has leaves with longer stems, but the acorns are stalkless (sessile) (see picture below). The English oak has leaves with almost no stem, but the acorns are borne on stalks. There is surprisingly little niche separation between the two oak species, although under natural conditions English oak preferentially colonizes wet bottom-lands whereas the sessile oak prefers slopes and tops of hills. 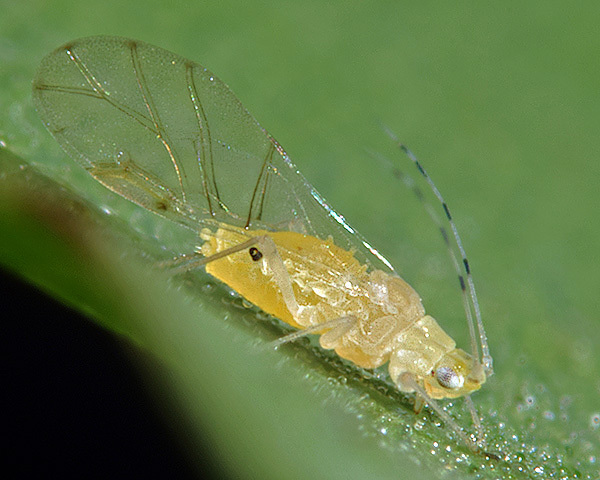 Despite the similarity of the host species, their aphid fauna is rather different. Tuberculatus neglectus is very much the dominant species on sessile oak, although some Tuberculatus annulatus are also often present. The image below shows an adult Tuberculatus annulatus (on the left with darkened spinal tubercles), alongside an adult Tuberculatus neglectus (on right), on sessile oak. 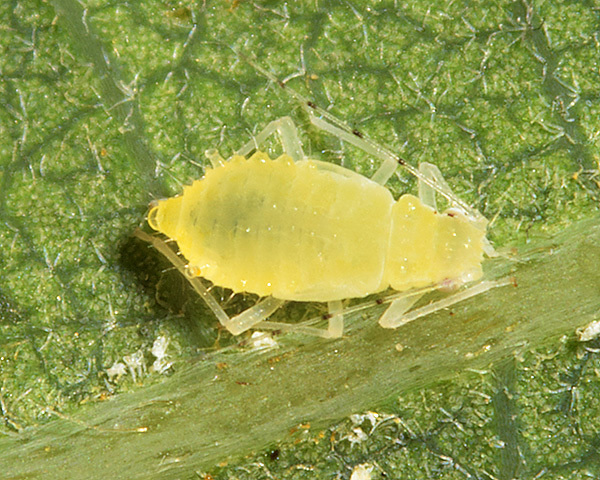 The presence of three similarly-sized tubercles (see picture below) is a reliable characteristic to discrimate the aphid from Tuberculatus annulatus, which has the anterior tubercle much larger than the other two. The darkening of the spinal tubercle on Tuberculatus annulatus cannot be used to differentiate the species as it does not hold for all specimens of that species. In addition, the siphunculi of Tuberculatus_neglectus are black except right at the base (see picture below), whereas those of Tuberculatus annulatus are black only on the distal one third to two thirds. Tuberculatus neglectus is rarely found on English oak. Durak & Wojciechowski (2008) noted that Tuberculatus neglectus was only a minor component (with a coefficient of dominance of less than 1%) of the aphid community on English oak in the Querco roboris-Pinetum forest association in Poland. Tuberculatus annulatus on the other hand was eudominant on English oak. 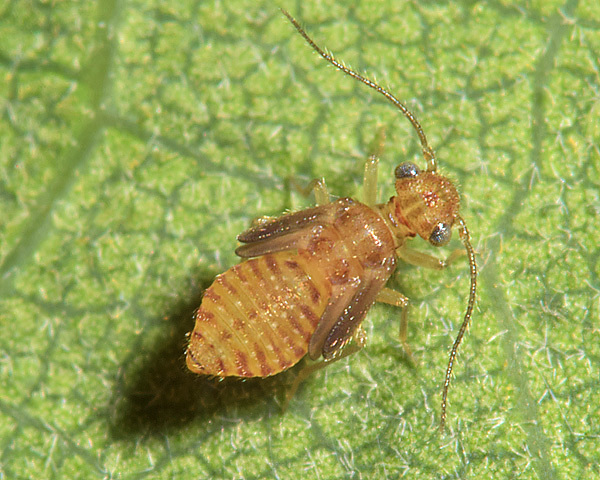 Tuberculatus neglectus has to share its habitat with a variety of other insects, especially psocids such as Ectopsocus petersii (see pictures below of adult and immature). 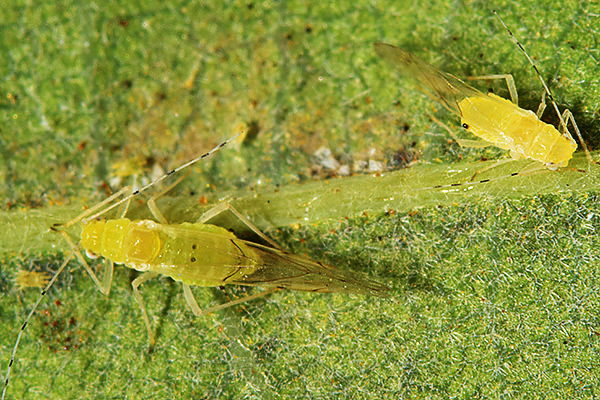 Psocids do not compete with aphids for food since they feed on algae and lichens that grow on the leaves. But they do compete for space on the leaf underside, and also affect the aphids' environment by removing detritus from the leaves. Tuberculatus neglectus has been recorded from 5 Quercus species (Quercus dentata, Quercus lusitanica, Quercus petraea, Quercus pubescens, Quercus robur) plus Quercus robur × petraea. Blackman & Eastop list 24 species of aphid as feeding on Quercus petraea worldwide, and provide formal identification keys. Of those aphid species, Baker (2015) lists 13 as occurring in Britain: Lachnus longirostris, Lachnus roboris, Moritziella corticalis, Myzocallis boerneri, Myzocallis castanicola, Phylloxera glabra, Stomaphis quercus, Thelaxes dryophila, Thelaxes suberi, Tuberculatus annulatus, Tuberculatus neglectus, Tuberculatus borealis and Tuberculatus querceus.